The RoxAnn GD is specifically intended for commercial fishing applications. The RoxMap Fishing Plotter package is included with the system but it is also compatible with many other third party plotter packages. It is provided with installation software which allows it to be adjusted by the user of installation engineer to suit any echosounder. Provides instructions on software installation and hardware set up to start using the RoxAnn quickly. A downloadable demonstration for use with all versions of RoxAnn product. It allows use of all functions as though operating in real time but uses internally generated ship tracks. It cannot be used for live navigation. It does not require a dongle. Setup application for the installation of the RoxAnn GD (all models except Swath). This applies to MK1 versions of the RoxAnn hardware. Check FAQ for operating system compatability. Includes USB driver for Windows XP, Vista and Windows 7. This may be used with the RoxAnn GD Installation application MK1 or RoxMap. * Please note that there are intermittent issues with these applications on Vista and Windows 7/10. Sonavision cannot guarantee reliable operation on these operating systems. This application allows low level control of some RoxAnn GD setings. Do not use this application without supervision or experience. 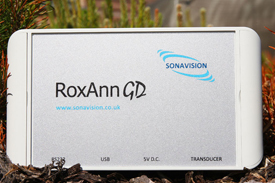 Inadvertant changes may prevent RoxAnn GD operation! It is officially compatable with windows xp . We cant gurantee its full functionality on Windows 7 or WIndows 10 eventhough it speears to be working.